I’m amazed that over 30,000 of us have done the 100 Day Goal since we started it 2 years ago. I had no idea the 100 Day Goal would be this big! NO IDEA! I started 100 Day Goal-ing by accident. Eight years ago I decided to write a book (as you do! ), but I was working full time, had three small children (number 4 came later) and I just couldn’t seem to get it together. Feeling a bit frustrated with my lack of progress, I gave myself a deadline. Get it done in 100 Days or quit. I picked 100 Days totally randomly. It had a nice ring to it. It was only much later, when reading about how our brains work, that I realised that I had accidentally stumbled on the totally best time period for a goal. Not too long, not too short. Just right to get a big project done! As well as the 100 day time frame I also decided to work on my book every single day. I didn’t have much spare time (well, none actually) but I figured if I could do a little bit each day, the job would get done. I chose to get up an hour early and write before the kids woke up. That was actually a little bit nuts because my kids were 5 am risers. But it was summertime, and I did it. Long story short, those two things worked. 100 Days, every day. 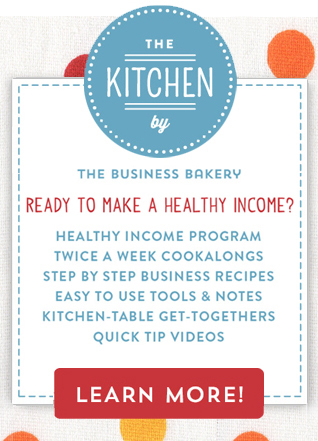 The book got written, picked up by a publisher and “How to Bake a Business” became a thing. Not long later I left my full time job and started running The Business Bakery. Working from home was SO fun after working in an office for years. But I soon started to find it really hard to get big things done. I had so much itty-bitty-daily-do stuff that I couldn’t seem to find the time or energy to work on my hefty projects and good ideas. Then I remembered the 100 Day Goal. And I started doing it again. Just me. Three 100 Day Goals a year. Stuff got done. I felt good. I started getting some of my private coaching clients doing the 100 Day Goal too. It worked well for them as well, but I still didn’t really consider the 100 Day Goal a thing. Until this happened. I was giving a talk about pricing at a women in business conference. The final speaker hadn’t turned up so the organiser asked me if I’d do the big final motivational ra-ra talk. “Just chat for about half an hour”, she said. Well I can usually talk the hind leg off a donkey. But at that moment I couldn’t think of anything to say. Nothing, nada, rien. I stood by the side of the stage, mind blank. Starting to quietly freak. It was exactly 100 Days until Christmas Eve. And so I talked about the 100 Day Goal. The half hour passed quickly, I left the stage feeling pretty pleased with my spontaneous talk, and didn’t think anymore about it until 200 ladies cornered me at the after-conference cocktails to find out how they could sign up for the 100 Day Goal. I hid in a cubicle in the Ladies Toilet, made a quick Mailchimp list (True! I couldn’t make this stuff up!) then reappeared with a link to the first 100 Day Goal list. I said I’d send them a daily email and we’d do this 100 Day Goal thing TOGETHER! Well over the next two years those emails got a LOT better, I put together the free 100 Day Goal Guide, started the Facebook group, listened to your feedback and six rounds of the 100 Day Goal later, we have a TON of amazing success stories. And I’m so bloomin’ proud of everyone who’s given it a go. Fancy joining us? We start again on 1 September and it’s totally FREE to do it with us!